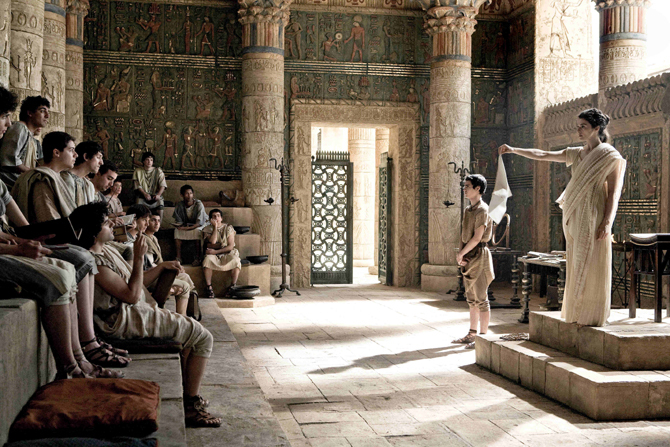 Hypatia (Rachel Weisz) demonstrates the questions surrounding gravity and the movement of the Earth to her students in Alexandria, watched by her slave Davus. After the mildly diverting but ultimately turgid Robin Hood, it was a relief to turn to a filmmaker with more imaginative ideas about presenting historical worlds. Alejandro Amenábar began his career with a string of distinctive films spanning horror, science fiction and melodrama, each of which were big hits at home in Spain. They topped the Spanish box office and broke records but apart from the English language The Others (2001) they haven’t had the same impact abroad. This is unfortunate and serves to highlight the dismissive way in which Anglo-American Cinema relegates any film from another culture to the arthouse sector. Such an approach mars an otherwise interesting review of Agora in Sight and Sound by Sophie Mayer and has formed a confused discourse around the film’s eventual distribution in the UK. This is the second English language film from Amenábar, featuring an international star in Rachel Weisz and a strong supporting cast. It was produced on a large budget, by European standards, in Malta – standing in for 4th/5th Century Alexandria. The narrative offers us a crucial moment in Mediterranean history – when ‘Christianised’ Roman subjects in the Egyptian city of Alexandria wrested power from the ‘pagan’ Greek aristocracy who had created the renowned library in the city. It presents a political, religious and military struggle around dogma, doctrine and ‘natural philosophy’ that focuses on the pivotal figure of Hypatia, the brilliant astronomer, philosopher and teacher. Hypatia (Rachel Weisz) is a philosopher and teacher, clever and beautiful, who is responsible for the education of the next generation of (male) leaders of Alexandria. The young men adore her, in particular Orestes (Oscar Isaac), but also her own young slave Davus (Max Minghella). But Alexandria is moving towards widespread civil revolt, led by Christian ‘activists’. This leads to a confrontation between the Greeks who still rule the city, the increasing numbers of Christian converts and the Jewish community caught between them. Meanwhile the Roman authorities stand back and play imperial policy games as the occupying power in the region. Throughout this turmoil, Hypatia tries to continue her scientific work which combines mathematics and astronomy and seeks to theorise about the movement of the Earth and the planets. But she finds herself caught up, as a rationalist, in the religious and political struggles within the city – now led by her ex-pupils. Wikipedia has a useful entry on Hypatia if, like me, you aren’t familiar with this clearly important historical figure. An agora, by the way, is a public square where proclamations might be made. I found this to be a film which first engaged me through its impressive staging, performances and direction then lost me for a short section when the narrative faltered – but which then grabbed me ferociously for the stunning final third. The flaw in the narrative was the way in which Amenábar attempted to move the story forward, explaining what happened in the interim period via on-screen text accompanied by science fiction-style zooms in and out of Alexandria as a dot on the map. I struggled to pick up the story again for a few minutes. On reflection, I think that presenting this story on film is a very difficult task and that generally Amenábar’s ideas work very well and perhaps when I watch the film again it will flow seamlessly. The other slight weakness was the performance of Oscar Isaac – but perhaps this was because he’d been the rather effete and silly King John in Ridley Scott’s Robin Hood that I saw the day before. Did his character in Agora really come up with a line of contemporary American speech or did I imagine it? The whole question of casting and dialogue coaching for narratives set in classical Greece/Rome has always been intriguing. Amenábar chose a casting strategy which seemed based primarily on notions of ‘realism’. The Greeks and Romans are played by West Europeans whereas the Egyptians (i.e. the slaves and the leaders of the Christians) are played by actors from the Mediterranean region or in the case of Hypatia’s older slave and technical assistant Aspasius, the Iranian actor Homayoun Ershadi. This strategy produces the first of several controversies likely to be associated with the film. The ‘villains’ of the story are the Christian bishop, and later Saint, Cyril, played here by Sami Samir and the main Christian agitator Ammonius (Ashraf Barhom). I can’t find anything about Samir’s background but I’m familiar with Barhom who is a well-known Palestinian actor from Galilee. So, in one sense, we have ‘authentic’ casting in terms of ethnicity and regional origin. On the other hand, this presents us with Christians whose appearance suggests the modern day Taliban – Ammonius leads a mob dressed in dark robes and headdress, many of whom are heavily bearded. 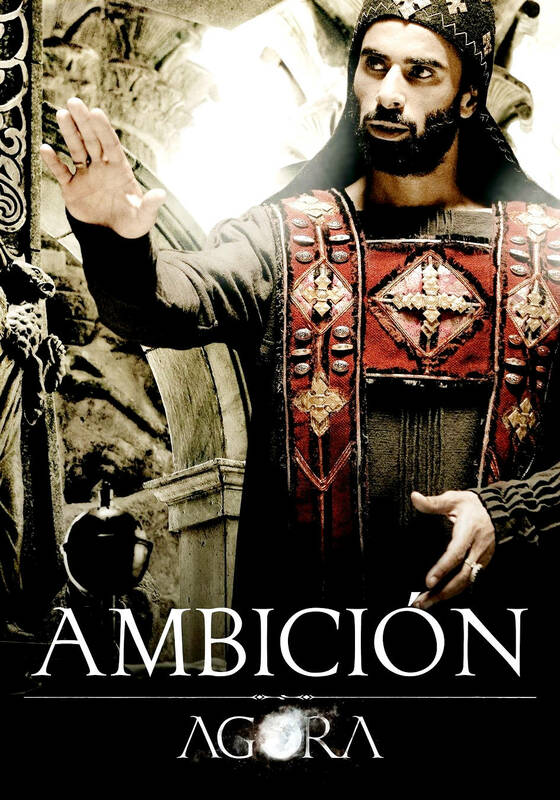 Sami Samir as Cyril in one of the Spanish posters for the film. The film can also be seen as a critique of imperial power in that the Romans are really unable to control the local holders of power and in a sense thus contribute to the carnage. But the central narrative about Hypatia refers to cinematic form of the biopic which in this case combines the story of a rationalist figure attacked by religious fanatics (the Galileo story) and the brilliant woman condemned by the actions of lesser men. Madame Curie comes to mind as a traditional Hollywood biopic with some of these elements. I won’t spoil Agora by revealing which aspects of the biopic are included and which left out. All of this suggests that there is an enormous range of ideas in Agora and I think it will repay a second and third viewing – and an exploration of historical sources. This was clearly a major undertaking for Amenábar and for a producer/writer/director/composer who produced his early films at a remarkable rate this was a long production process – completion coming five years after the release of Mar adentro. For me, Amenábar is a major director and I’m saddened by the comparative box-office failure of his films outside Spain. You’ll probably need to wait for this film on DVD, but I think that the wait will be worthwhile. This entry was posted in Spanish Cinema. Bookmark the permalink. I thought Isaac’s performance was as stand-out in the movie! As for the “contemporary” dialogue. It’s a common misconception that people talked like they wrote in antiquity. Come on, there is such a thing as common speech. Everytime we are lucky to find unofficial, private scriptures of antiquity or the times after we get a gimps at how people might have talked in private. Or, I dunno, just read some of the old Roman comedies. Definitely closer to Orestes’ delightful sarcams than than sword and sandal clichés. I think we agree on the dialogue question. As I wrote, it was strange to see the same actor in two different historical roles one after the other. The other point was simply that I thought he came across as an American actor. Nothing wrong with that of course – but because there were no other Americans in the cast he stood out against the Europeans. I see from research that his background which includes ‘French Israeli’ as well as ‘Cuban-Guatemalan’ is actually very much like some of the other cast members – so the casting was justified in terms of Amenabar’s overall strategy. I’m happy to reconsider if my comment was unreasonable. I did find the various accents distracting. Especially the British accents. Once the action intensified though, the accents no longer were distracting.